Celebrity weddings require a great deal of organization to pull it off successfully. Most wedding organizers who work with celebrities are in high demand, due to the resources they have and their capability to pull off even the most outrageous demands. At the same time, celebrity wedding venue decorators need to have multitasking skills and the patience to deal with the chaos of organizing a wedding. You are planning the most special day in the lives of your clients. It is of utmost importance to form a friendship with them to get an idea of their vision for the wedding day. Have a one on one discussion with your clients to open dialogues that you can get a clear picture of what are their exact requirements. Your customers trust you enough to hand over the reins of the biggest day of their lives. So it is up to you to deliver exactly what you promised. 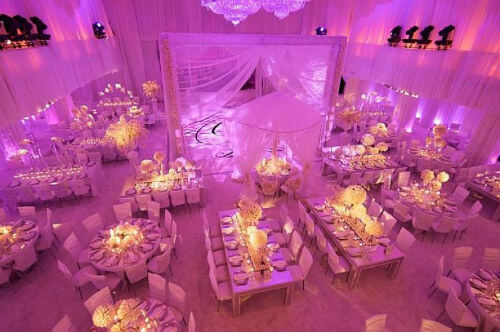 Celebrities often make larger than life demands, and a good wedding planner will be able to make it come to life. The word no should never be uttered to the client, rather offer them other ideas that might make their demands a bit more realistic and doable. A wedding planner is only as good as their network of vendors of resources. They are the players who help you bring to life the wedding that you have envisioned with your clients. Once you start networking with the vendors, they will also realize how committed you are to making everything work, and you will get back the same commitment from them. Handpick staff who will make great team players. It is critical to choose people who won’t drop the ball under pressure and can handle any crisis that comes their way. An event planner is only as good as their team. Vision boards can be very helpful in helping the clients visualize their wedding day in all its glory. You can put up the designs and the materials you have selected to help get inspired for more creative ideas. An Indian wedding has many moving parts that need to be coordinated to the exact minute. Unfortunately, problems do crop up at the last minute, and it is up to the wedding planners to make sure no glaring errors are apparent to the guests or the clients. You need to be quick on your feet and be able to make alternate arrangements as and when required. The security aspects of celebrity weddings are very critical to ensure the safety of your clients as well as the guests. Most wedding planners hire separate security firms to handle the unwanted party crashers as well uninvited press personnel. So get your feet moving and give your clients the exact wedding they are dreaming of!